Contemporary chamber music is Molly’s primary musical interest, and she is currently involved with two ensembles. 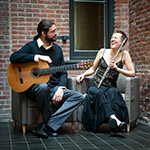 Formed by Molly Barth and guitarist Dieter Hennings, Duo Damiana is focused on broadening the cutting-edge body of repertoire for flute and guitar, and released “Castillos de Viento” with Innova Records. The Zohn Collective, a new music initiative, brings together a core ensemble of musicians with deep musical ties for recording and performance projects throughout the world; a recording is forthcoming on the Naxos Oberlin label. As a founding member of the new music sextet Eighth Blackbird, Molly won the 2007 “Best Chamber Music Performance” Grammy Award, recorded with Cedille Records, and was granted the 2000 Naumburg Chamber Music Award and first prize at the 1998 Concert Artists Guild Competition. 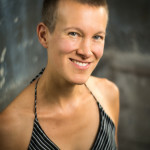 As co-founder of the Beta Collide New Music Project, Molly collaborated with individuals from a broad spectrum of disciplines and recorded with Innova Records. 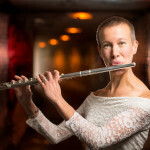 Molly is Assistant Professor of Flute at the Blair School of Music, Vanderbilt University. 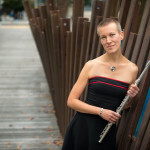 Formerly Associate Flute Professor at the University of Oregon, she previously taught at Willamette University and held residencies at the University of Chicago and the University of Richmond. She is a graduate of the Oberlin College- Conservatory of Music, Cincinnati Conservatory, and Northwestern University. Molly is a Burkart Artist, and she also plays a 1953 Haynes alto flute. "Barth is a rock-solid player who knows this music inside and out....Barth puts across all her selections with spirit and imagination. Even if you know Fukushima’s Mei (1962), your jaw will drop at 4:30 where she switches from a fortissimo high note to a pianissimo whistle tone. Such is her virtuosity that much of the writing sounds easier to play than it actually is." "The Vivaldi concerto...is almost absurdly virtuosic, with incredibly long, fast-moving passages that whizzed by with literally almost no room for the soloist to breathe. Flautist Molly Barth, though, was on fire and in control the entire time." "Aside from the incredibly agile work in the brisk outer movements, the central slow movement revealed a depth of expression rarely suspected in Vivaldi concertos....Ms. Barth at times seemed to dance along with the music, a modern day pied piper of compelling execution."